Revenue in the Hobby & Stationery segment amounts to US$52,981m in 2019. Revenue is expected to show an annual growth rate (CAGR 2019-2023) of 9.0%, resulting in a market volume of US$74,822m by 2023. User penetration is 16.5% in 2019 and is expected to hit 25.9% by 2023. The average revenue per user (ARPU) currently amounts to US$975.58. In global comparison, most revenue is generated in China (US$54,600m in 2019). The eCommerce market segment Hobby & Stationery contains the online sale of hobby items and stationery goods. Musical instruments, photo and printing needs, office equipment, pens & paper, collectors’ pieces (including art and antiques), car parts and adult entertainment products are included in this segment. Hobby-related products already found in the Sports & Outdoor and DIY, Garden, Pets market segments are not included. All monetary figures refer to the annual gross revenue and do not factor in shipping costs. Reading Support Revenue in the Hobby & Stationery segment amounts to US$52,981m in 2019. Reading Support The Hobby & Stationery segment is expected to show a revenue growth of 12.1% in 2020. Reading Support In the Hobby & Stationery segment, the number of users is expected to amount to 87.7m by 2023. 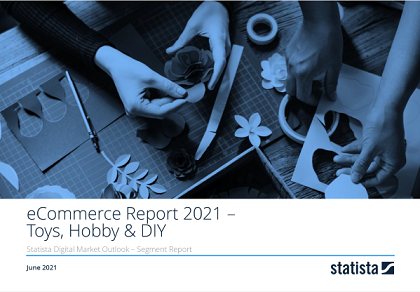 Reading Support User penetration in the Hobby & Stationery segment is at 16.5% in 2019. Reading Support The average revenue per user (ARPU) in the Hobby & Stationery segment amounts to US$975.58 in 2019. The following boxes show the top 5 online stores by eCommerce net sales (first party sales) in the Hobby & Stationery segment in United States. Data basis for net sales and market share are company surveys, annual reports and a complex sales forecast model developed by Statista. Reading Support In the year 2017 a share of 27.9% of users is 25-34 years old. Reading Support In the year 2017 a share of 57.2% of users is female. Reading Support In the year 2017 a share of 37.8% of users is in the medium income group. Reading Support With a market volume of US$54,600m in 2019, most revenue is generated in China. Reading Support With a rate of 25.3%, the user penetration in the Hobby & Stationery segment is highest in South Korea. Here you can find more studies and statistics about "Hobby & Stationery".